Explanation: Higher than the highest mountain lies the realm of the aurora. Aurorae rarely reach below 60 kilometres, and can range up to 1000 kilometres. Aurora light results from energetic electrons and protons striking atoms and molecules in the Earth's atmosphere. 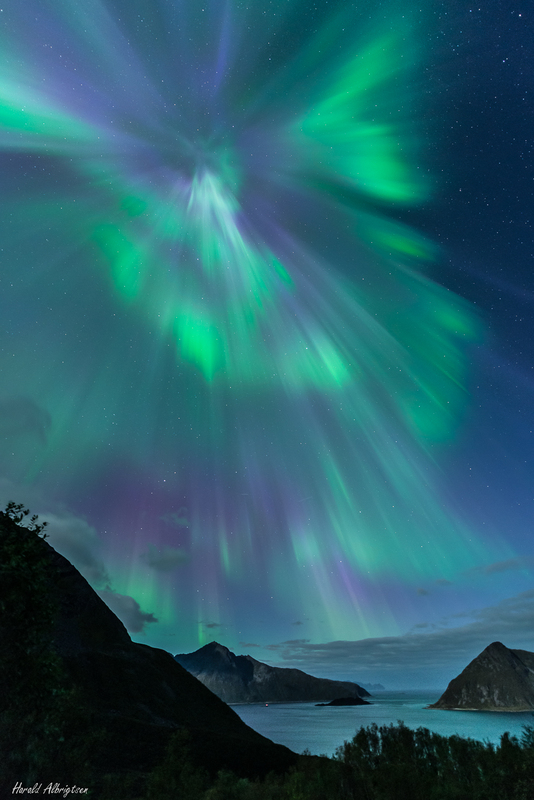 Somewhat uncommon, an auroral corona appears as a centre point for a surrounding display and may occur when an aurora develops directly overhead, or when auroral rays are pointed nearly toward the observer. This picturesque but brief green and purple aurora exhibition occurred last month high above Kvaløya, Tromsø, Norway. The Sessøyfjorden fjord runs through the foreground, while numerous stars are visible far in the distance.